...That's What She Said: The Call of Duty: Black Ops First Look Preview Event! The Call of Duty: Black Ops First Look Preview Event! Here it is folks, the post you've all been waiting for. I warned you, it's long, but it's worth it! Friday started out with excitement in the air. I live in the area so I had to meet the guys at Treyarch. I was told they would be picked up from the hotel at 1:30 so I left at the same time. Shortly after I got there I saw a black shuttle pull into the parking lot. Perfect timing. Our time had come. We filed into the lobby and signed our NDAs (non-disclosure agreements). We got a couple of group shots taken and then the community manager, Josh Olin (the famous JD 2020), ushered us out of the lobby. We made a pit stop at the kitchen then we entered an extremely red room. I don’t mean the walls or the carpets were red but the room was flooded with red light. The walls were covered with documents and the conference table had a phone on it you would have expected to have seen in the White House a long time ago. It looked like a War Room. There were seats for us to take and I, being rather short, took one in the front row. John Rafacz and Josh Sellinger took the floor to begin. They laid down the law for us about how things were going to go down. We were told we were going to be seeing two levels. You could hear music and see the opening title screen. The music was almost eerie, but it fit. I can’t even describe it but that music alone piqued my interest. The first level was saw was WMD. You’d recognize it from the gameplay trailer that aired not too long ago. This level was in the snow and you are equipped with a camouflaged crossbow with a scope. Talk about badass. You see a couple different weapons in this level: the crossbow which also had bolts with exploding tips, an AUG with multiple attachments and camouflage, and an AK-47. We got to see the SR-71 in this level and found that you got to direct troops from the air. There is also a slo-mo breach in this level after doing some rappelling. At one point you see someone get a throwing knife to the neck. I gotta admit, I didn’t see that coming, but wow, was it extremely well done. At the end of the level you take a running leap off a cliff into nothingness. What is cool about this jump is you can actual move your guy as you’re in the air. I know I’m not even doing this level justice. You really have to see it. You have the option of either moving stealthily or rushing in balls to the wall. The guy who was playing through the level chose to go balls to the wall and thank god for demigod mode because I’m pretty sure there were times he would not have survived through the level. Not all of us can be the best player, I know I’m not. I could use my own demigod mode to get through campaigns, I just can’t do it without dying multiple times, and I play it on Normal!! The other level we saw was Slaughterhouse. This is the Battle of Hue City during the Tet Offensive. We are in a chopper to begin with and rappel down the rope air assault style. In this level we see the SPAS-12 with incendiary rounds called Dragonsbreath. I gotta tell you, I’m REALLY looking forward to using that weapon. It is the epitome of awesome. Generally, I avoid shotguns in the Call of Duty games but this one I’d really like to try out. Who wouldn’t want to set people on fire?? We also see the CAR-15 Commando as well. You see the SOG take over command and order fire on various points in which you direct. I do recall seeing an M113 tank named Bottom Feeder during this battle. I like their style. Cesar Stastny took the floor to tell us about the PC platform. There wasn’t a definite answer about mod tools, a question I know a lot of people were curious about. But, there was an answer to a different question that people cared quite a bit about. Cesar and Josh bared their chests in a Superman-esque movement to reveal a shirt that answered a very important question. What did that shirt say? Dedicated servers. That’s right, it sure did. What does that mean to me? Not a thing, as I’ve never been a PC gamer but it seems to be an answer that will make a lot of PC gamers quite happy. He also mentioned that there was an improved browser. Dan Bunting and David Vonderhaar also took the stage to talk to us a bit about multiplayer. One change that came about in the making of this game was the fact that the team working on MP began working on it from Day One. They told us that there were maps that were designed specifically for MP and that no maps were taken from SP for MP. Host migration will also return. One thing that really hit home for me is they said “why change something that works?” What does that mean? Leave with party is back! No more telling the party you are with, provided you’re the party leader, to back out on you. No more losing people left and right because they didn’t hear you were backing out and regrouping. That right there made my day. Oh and I’ve got one last thing to say about their MP talk—Barebones baby, barebones. 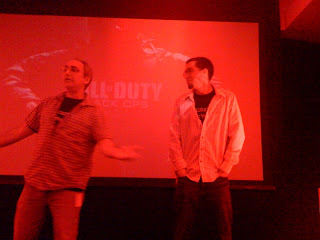 Mark Lamia spoke to us a bit on the background of Black Ops. Unfortunately, I was so enthralled I forgot to take notes! I know, I know, I’m a horrible person. He did tell us a little bit about what Black Ops basically were—deniable operations during the Cold War as well as who the SOG were and how badass they were. Basically, he was pointing out why this game was going to be so awesome. As if we didn’t already know! We got to go around the studio a little bit but obviously we weren’t allowed to see everything. We did get to see how they build and outfit characters. You’d be amazed at the research that goes into these games. The outfits characters wear in the game have been researched and made sure to look as authentic as possible. 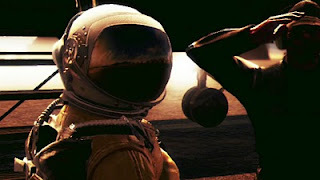 The lengths they went to get the uniform that a pilot wore to fly an SR-71 Blackbird—well, let’s just say it wasn’t easy but luckily NASA helped them out. The facial expressions and movements are also made to look as realistic as possible. This is done with tension mapping and motion capture technology. They utilize 200 cameras in order to do this. It is amazing to see a side-by-side comparison to show how advanced this technology is. They are really outdoing themselves with this game. We also got to see the new tactics which they are employing for AI in the game. They have changed the AI to allow for evasive tactics. If you get an AI in your sights they will dodge you in one way or another. A few of the community members got to have a hands-on experience with this. They took on 4 AI rushers at once and let me tell you, as a spectator it did not look easy. I can’t wait to see this during gameplay. We were told that there is a 2 person split-screen local co-op mode as well as a 4 person online co-op mode that is separate from the campaign. What does this mean? They didn’t tell us. I made my own conclusions from what they meant, I’ll let you do the same. Well folks, that’s all I’ve got. I hope that I gave you a little insight of what is to come. Make sure to check out the other community members' posts on the preview! 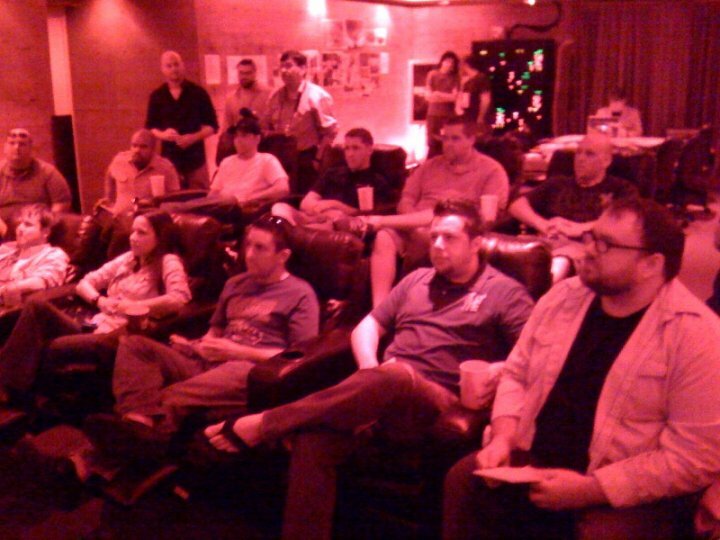 Had a great time at Treyarch. Definitely looking forward to Black Ops! Thank you both! I'm looking forward to actually playing it. I can't wait to take the controls for this game. Not as I expected but oh well. Everyones question is Will there be Zombies? There was no talk of zombies but read this part: We were told that there is a 2 person split-screen local co-op mode as well as a 4 person online co-op mode that is separate from the campaign. What does this mean? They didn’t tell us. I made my own conclusions from what they meant, I’ll let you do the same. Could mean Zombies, could mean something else. Nice article Morgan, i enjoyed it. Really looking forward to this games release and getting back into the COD series after skipping over the MW-2 project. Real happy over the dedicated server news. Now if they would confirm MOD tools and server files it would be a solid home run.